The age that a dog will start to slow down physically varies with each particular breed. Even dogs of a certain breed can age differently, with some showing and feeling their age earlier than others. Generally, large-breed dogs like Great Danes and Irish Wolfhounds show signs of aging many years earlier than small breeds such as Schipperkes and Toy Poodles. Of utmost importance to the aging pet is yearly veterinarian exams. This is the first step in keeping your pet healthy. Your vet may also want to perform blood tests or x-rays that will help him/her to evaluate how well your dog is doing internally. In between visits if your dog exhibits any symptoms of concern, contact your veterinarian for an examination and diagnosis. If your older dog becomes incontinent, he can still remain a part of the family with the help of belly bands. 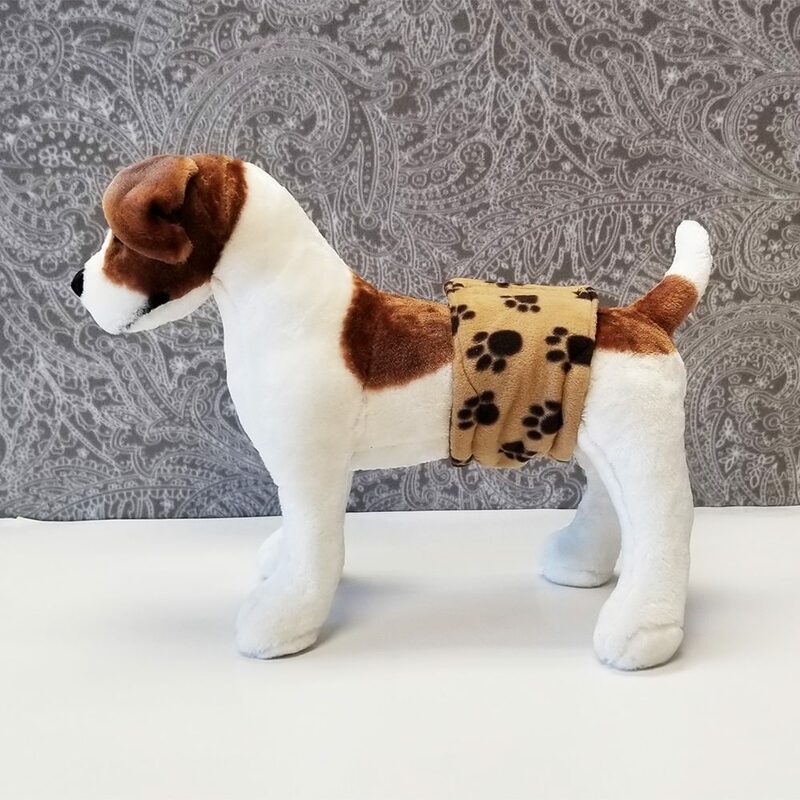 Belly bands wrap around a boy dog’s tummy or around the tummy and the back like a skirt for girl dogs. Using sanitary or human incontinence pads from the grocery store as a liner in the bands, urine is contained and your dog stays clean and dry. You can find quality belly bands at bellybands.net. Aging dogs also need comfort, and a soft, orthopedic bed is important. Just as in people, an aging dog’s joints often deteriorate, and an orthopedic bed will reduce pressure on the joints, resulting is less pain. With joint deterioration, slower and more painful movement often results. If your dog has been diagnosed with this problem, supplements such as Glucosamine and Chondroitin have been scientifically proven to aid arthritis and many other joint problems. Many vets recommend this product. Your vet may also recommend buffered canine aspirin for pain, and it is often enough to restore comfort to an aging dog. In severe cases, prescription drugs may be required, but keep in mind that some of the more popular prescription pain relievers for dogs can damage organs and shorten your dog’s life. It is always wise to use a pain reliever with the least amount of side effects first. If stronger medication is necessary, this should be considered as your dog deserves to be comfortable, and you and your vet should discuss the pro’s and con’s of such medication. Certainly, the most important thing to keep in mind is retaining a good comfort level and quality of life for your dog. One of the most important things you can do for your aging dog is to keep him in proper weight. Excess weight adds stress to weakening joints, causing even more deterioration and pain. Feeding table scraps is a leading cause of over-weight dogs. Eliminate table scraps and feed low-fat treats. Even so, feed these sparingly. Your dog’s main source of nutrition should be a premium dog food. Don’t think you are depriving your dog if you don’t feed him lots of table scraps and treats. HE has trained YOU to feel this way. You love your dog, so show it by keeping him in proper weight. Just because your dog is aging, doesn’t mean that he shouldn’t exercise. Moderate, non-stressful exercise can help to maintain muscle mass and further reduce joint stress. Consider leisurely, daily walks around the block. If it is a cold day, be sure to put a warm sweater on your dog before going outside. Cold weather can aggravate joint pain. Or, if the weather is warm, and you are lucky enough to have a pool that your dog can swim in, it can be an excellent way to keep stress off of your dog’s joints while exercising. Stop when your dog has had enough of any exercise. He’ll let you know by slowing down, panting, or appearing tired. Another way to help medium- and large-sized dogs is to elevate food and water bowls. Aging pets often have soreness or stiffness in their necks, making it painful to lower their heads to reach a food or water bowl that is on the floor. Raised bowls can help to ease this pain while eating. And last, keep your dog’s teeth clean by brushing on a regular basis. Tartar-encrusted teeth are a breeding ground for bacteria and disease, which can spread throughout the body. Your vet can check your dog’s teeth to ensure that they are clean and healthy.